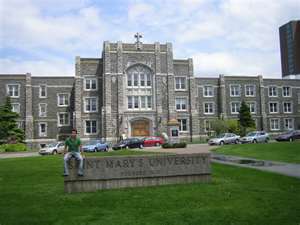 Today I had the pleasure of meeting several students who were planning to attend Saint Mary's University (SMU) in Halifax. This is the unversity where I took my Bachelor of Arts and Honours in Psychology, so as an alumnist I was asked if I would meet with students, as well as their parents to provide them with information about living in Halifax, as well as my experience as a student at SMU. The agency that organizes activities for SMU in India had a driver pick me up at my hotel and brought me to their office. They had scheduled six meetings with prospective students during a two hour time frame. When I arrived at the office, about 10 km from my hotel, I had an opportunity to meet the staff who were incredibly friendly and extremely well versed in Halifax and SMU. At about 2:30pm the first of the students arrived and we met in a meeting space just inside the office. What a great opportunity to meet with students, promote Halifax as a great destination to live and share my experiences as a student at SMU. Most students were interested in knowing about the weather....there was lots of hesitation about the cold weather we have in Canada, which is reasonable since it is so hot in India...the types of employment opportunities in Halifax...most students I spoke with were interested in or entering into a business program or computer science program, with one planning to do her MBA. They were also interested in knowing how safe it was in the city, what residence life would be like, as well as the option to live off campus, and about transportation. Several of the students were interested in knowing about what kind of sports that were available to them...one was very interested in finding information about lawn tennis, which I have never heard of (so if you know of this being offered anywhere in the city, let me know) and another was interested in seeing heavy metal and rock bands like AC/CD and Metalica....not that different from most students entering university life. Parents were very interested in knowing if Halifax was a safe city, if there was a large number of Indian people in Halifax and if there were places to buy Indian food. They were glad to hear that Halifax is easily accessible by foot or bus, and a very friendly university city. Everyone was interested in knowing about part-time job opportunities for students and what kind of skills they would need to have to get a job. One student asked me what my advice would be to her since she is coming to SMU in September...my recommendation was to take advantage of all the university and the city has to offer. There's lots to do in the city and the more you became involved, the more you will take away from the experience. After about 2 hours of chatting with people, I headed back to my hotel to enjoy the rest of my evening before heading to Pondicherry via Chennai in the morning, where I will be meeting up with my Habitat for Humanity team....so EXCITING!!!!!! I want to thank Saint Mayr's University for the opportunity to meet with students and their parents and welcome the opportunity to do so in the future. The only regret I have is that I wasn't able to actually meet students in their schools, but they are on break now after just finishing their final board exams...maybe next time!!!! So I'm off to Chennai tomorrow on a 6:50am flight and will fill you in on my team whenever I get the opportunity.